For the sixth year running, the country's very best sales offices competed once again for the top honours in this year's Top 50 Sales Offices ranking, focusing particularly on volume and performance efficiency. ReNet is proud to be associated with REB Top 50 Offices for 2018. An award such as this enables all staff to be proud of their contributions and be recognised on a national stage. As one of Australia’s largest providers of CRM and web services to real estate offices, ReNet understands the drive, the time and the sweat that goes into running a successful real estate business. ReNet congratulates all of the ranked offices and is working towards helping ReNet powered offices appear on this list. The REB Top 50 Sales Offices ranking, partnered by ReNet, is the gold-standard of rankings for real estate sales offices in the country and sets the high-water mark for others to aspire to. It has been setting the bar for the last six years, identifying the best in the industry. The contraction of some of Australia’s traditionally buoyant markets has put pressure on sales offices around the country, but true to form the best ones continue to perform well ahead of the curve and they continue to deliver outstanding results. 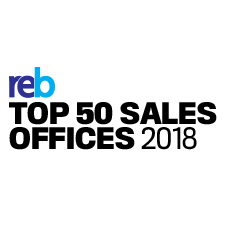 This year’s REB Top 50 Sales Offices unveils a group of high-performance operations that continue to deliver phenomenal results, setting a standard that others may find exceedingly difficult to catch up to let alone pass. The metrics used to generate the REB Top 50 Sales Offices ranking are the number of properties sold, the total dollar volume of properties sold and efficiency rating of sales people to support staff. The offices that list and sell the most, the most efficiently will out rank the others. The REB Top 50 Sales Offices has always produced interesting statistics – and this year is no different. Indicative of the cooling in the market, the average number of sales across all 50 offices in 2018 was 317, down from 364 in 2017. This contrasts with the top 5 offices in both 2017 and 2018 where the number was at or above 500 sales. Equally the average value of the sales is $218 million in 2018, down from $272m in 2017. The results in the top 10 offices, however, revealed some interesting insights. Reversing the group trend, in 2018 the top 10 differentiated themselves from the rest by selling more in 2018 (461) than in 2017 (317), albeit for less average value. In 2018 the average value was $667k while in 2017 it was $686k – again, not unexpected given the tightening markets across the country. Statistics also reveal that in 2018 the Top 50 offices had on average 10 sales people, down from 12 in 2017. They employed 5 support people in 2018, slightly ahead of the 4.8 in 2017. Interestingly, the average days on market across the group moved from 39.9 days in 2017, to 44 days this year. Read together this suggests that as the market contracts the best offices in the country are focusing more on supporting sales as the sale takes longer to conclude. REB will deliver more detailed analysis in the coming months on the Top 50 Sales Offices – and deliver inside stories from these highly ranked offices.